Last week we went to Winter Wonderland 2012, in Hyde Park, London, England, Northern Hemisphere, Planet Earth, Sol Solar System, Milky Way Galaxy. Just to make it clear that it wasn’t that other Winter Wonderland on the planet Allosimanius Syneca, familiar to everyone who’s read The Hitchhiker’s Guide to the Galaxy, or seen the movie, or listened to the radio plays or seen, in passing an abridged and completely unauthorized copy of the book, in Cliff Notes form. Mary and our niece, Caroline, desired to see the bright lights of the Wonderland, while I was in pursuit of glühwein, currywurst and Gummi Bears. OK, I lied about the Gummi Bears – I have no interest in them at all. I mean you can get them at any newsagent and Tube station platform vender, so why go out on a freezing cold night to buy some from a fair stand, at no doubt horribly inflated prices? 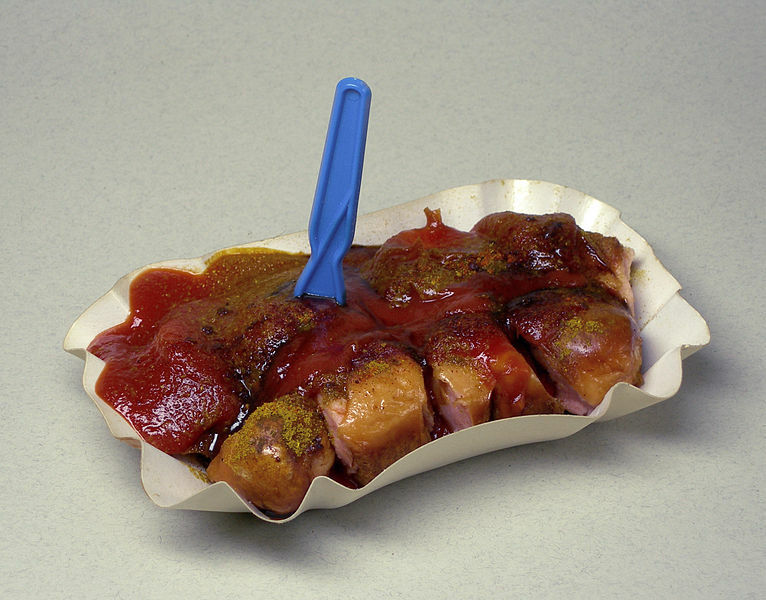 And the currywurst, well, I didn’t find out about that till we got to the fair. But once I saw they had currywurst, I had to have it. Because currywurst! Who wouldn’t want to sample the delight that is a steamed and fried totally bland sausage, covered in ketchup and sprinkled with curry powder? So, upon entering the Wondrous Winter Wonderland, which is both alliterative and repetitive, but I’m sure you saw that, we discovered that indeed there was glühwein sold at every third stand. Along with German lager, which has a distinctly stronger pull for me. But I couldn’t let pass the opportunity to sample something with a name that sounds like someone clearing their throat. I often pick foods to try because of the way they sound or because of names that include amusing accent marks. And glühwein is a double treat with both a funny sounding name and an umlaut. Mulled wine, as this is what glühwein is, sold from a faux Bavarian faux wood market stand is as dire as one might imagine, if one imagines really, really hard. Still warm alcoholic beverages on a bitterly cold night are always welcome, especially if one washes it all down with ice-cold Germanic lager. Pork rinds are looking pretty good right now, aren’t they? The currywurst was, pretty much as expected, as bad as the glühwein. I could point out that currywurst is one of the most popular snack foods in Germany and sneer, but alas, I come from a country that celebrates the pork rind, so I fear I have no ground to stand upon. If you have the chance to sample some currywurst, I’d still recommend you do so, if only to tick off that particular box on your Snack Foods From Around The World Checklist. What you don’t have a Snack Food From Around the World Checklist? I should get around to developing an app for that, immediately after I finish winning the award for most improved grammarian. Looks kids! Zombie Santa is coming to get you! Other than the culinary offeringss, the Winter Wonderland didn’t offer much else of note besides a bunch of terrifying rides. Terrifying for a number of reasons, not least of which is that most of the rides are German. I don’t know why but German carnival rides just sound inherently scary. 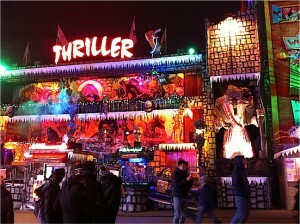 And why are there so many funhouse type attractions at a Christmas fair? Finally, there are haunted dark rides which have been minimally repurposed into Christmasy haunted dark rides through the rather simple expedient of dressing an animated skeleton out front in a Santa outfit. Yes, nothing says Yuletime cheer to me like a cackling zombie Santa skeleton. The toddlers will be delighted!